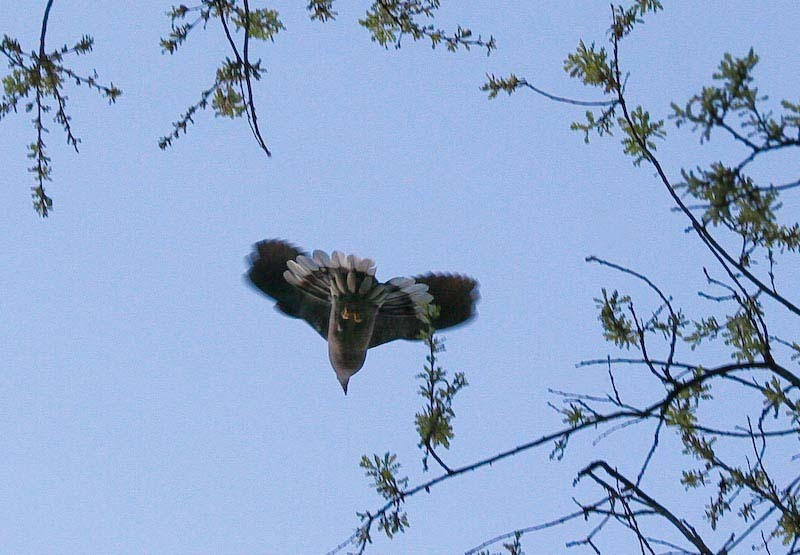 In honor of beloved partner Angus, who died 15 years ago today, May 13 . . . a Band-Tail Pigeon takes flight from his perch atop a giant valley oak, so high in the sky . . .
A moving tribute...(no pun intended). The photograph is incredible--such detail in the feathers and leaves. The pigeon is framed, but only for an instant--you've captured the moment. It is indeed a moving tribute, Jane. I love the underside of the tail feathers! A bird in flight, but so still in the shot. Prayerful memorial. Nice. A lovely tribute. It seems to reverberate with dogwood blossom you photographed earlier this month. May his spirit fly above the Gulch and all of us who gather there. I wish I had known him, but at least I can relish the circle he left behind. Agree with above. But something about this makes me want to wear a hat. :) Seriously, may the memory of Angus continue to raise your spirit. Tho this does not look like the Angus I remember, it does somehow capture a part of his spirit, right down to the one missing tail feather. Second try at leaving a comment, this is just a test.